They are on every golf course waiting patiently to gobble up golf balls, filled with fine sand on the the side of the green. Bunkers, sand traps, death deserts, whatever you want to call them...they are a part of the game that can make things tricky if your ball gets stuck in one. No one likes a bunker, but alas, they are forever a part of the avid golfer’s life. You can’t go around them, over or under-you just have to beef up the confidence and work your way through them. If bunkers aren’t your cup of tea (are they anyone’s?) 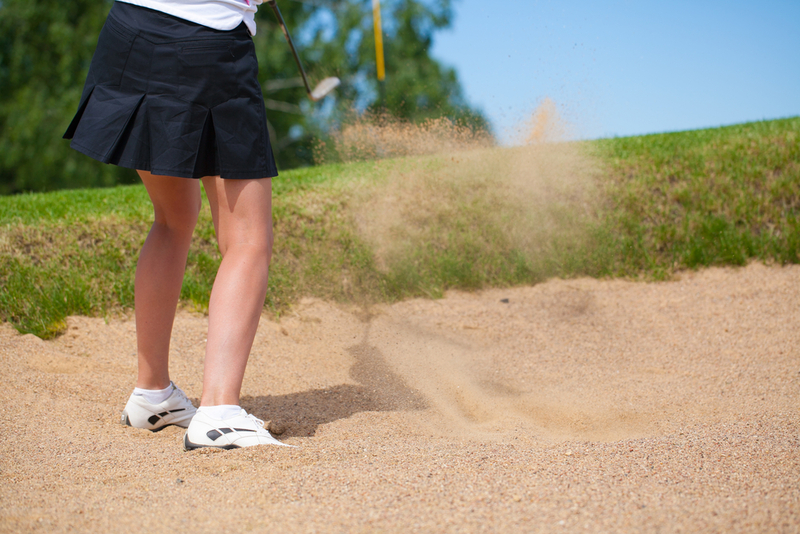 you can tackle them head on by learning how to hit a bunker shot. Here are our top tips for success. If you don’t have much green to work with, you’ll want something like a 60 degree lob wedge that won’t cause the ball to roll a lot. A sand wedge is a handy option if you do have green to work with. It’s a lower lofted wedge that will produce a longer flight out of the trap. What you’ll want to focus on most is your set up to swing. Let’s start with your feet. Really dig in so you can feel how deep the sand is, then solidify your base. Generally, you’ll play the ball off your front foot. Now, you’re aiming for a few different things: lower, softer ball flight for a sharp angle. To achieve this, widen your stance as well as the clubface and make sure weight is in your front foot. Once your stance is down pat, it’s time to execute an outside-in swing path. This will help the ball fly high and soft with enough control. Make sure to follow through with your swing without stopping once impact is made.